(1) Intercepts. Set x = 0 and y = 0 to find any y- and x-intercepts respectively. the origin if (−x, −y) also satisfies the equation. (3) Asymptotes. The line y = b is a horizontal asymptote of the graph of a function f if either inspect the degrees of P(x) and Q(x), then use the Rational Function Theorem. The line x = c is a vertical asymptote of the rational function if Q(c) = 0 but P(c) ≠ 0. (4) Points of discontinuity. Identify points not in the domain of a function, particularly where the denominator equals zero. SOLUTION: If x = 0, then y = −1. Also, y = 0 when the numerator equals zero, which is when A check shows that the graph does not possess any of the symmetries described above. 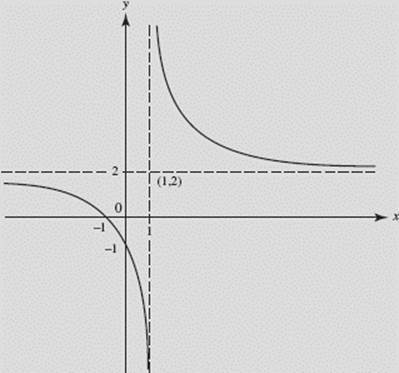 Since y → 2 as x → ±∞, y = 2 is a horizontal asymptote; also, x = 1 is a vertical asymptote. The function is defined for all reals except x = 1 ; the latter is the only point of discontinuity. From y ′ we see that the function decreases everywhere (except at x = 1), and from y ″ that the curve is concave down if x < 1, up if x > 1. See Figure N4–8. Verify the preceding on your calculator, using [−4,4] × [−4, 8]. (a) 3y2 + x = 2; (b) y = x + (c) x2 − 3y2 = 27. (a) Suppose point (x, y) is on this graph. Then so is point (x, −y), since 3(−y)2 + x = 2 is equivalent to 3y2 + x = 2. Then (a) is symmetric about the x-axis. Therefore the graph of this function is symmetric about the origin. (c) This graph is symmetric about the x-axis, the y-axis, and the origin. It is easy to see that, if point (x, y) satisfies the equation, so do points (x, −y), (−x, y), and (−x, −y).